I have read that some 20 senior lawyers want to reform the legal profession. There is nothing wrong with reform. I Iove genuine, selfless and evenhanded reforms. My problem is we must be careful so that we don’t mistake rebellion or self-serving activities or initiatives for reform. I have NOT seen any genuine move towards any credible reform because any attempt at reform without rule of law is doomed to derail. One Major way the Justice sector could be reformed is by the NBA setting up a Committee to that effect or by convening an all-stakeholders’ Conference to dispassionately discuss the real such issues. Reforms do not come through the back door. Anyone who wants reforms in the justice sector should go through the right channel and within Rule of law. The Nigerian Bar has a Leadership. Everyone ought to cooperate with the existing Leadership. *If we NO LONGER want our current Bar Leaders, we should follow due process of law and remove and replace them. * It is allowed. But until then, we have a duty to respect our leaders. And to make disinterested suggestions and offer constructive criticisms aimed to achieve progress for the bar and Bench. Else, I remind us that One good turn deserves another. Let’s not forget that what goes round comes round. I am aware that NBA currently condemns and denounces all acts and forms of corruption. *The day NBA Leadership supports any corrupt person, NBA loses my support. * Because corruption is a cankerworm. However, corruption extends beyond stealing of money or public funds. Abuse of and desecration of the Constitution and rule of law is a worse act of corruption. * Corruption can only be effectively dealt with within the ambits of rule of law, due process, evenhandedness and impartiality. Anything other than that is JUNGLE JUSTICE and totalitarianism which would take us back to the dark ages of Might is Right. And I assure you that NO Nigerian is safe under such a crude system. NBA’s current stand on CJN Onoghen’s is RIGHT in my view. NBA wants all things to be done according to laid down legal processes and procedures. The axe of justice may grind slowly, but it sure will get to its destination successfully. NBA’s position, if I get it right, is that if CJN Onoghen is found to be corrupt, there’re LEGALLY ESTABLISHED procedures for disciplining the CJN or for removing or suspending the CJN and for punishing him. If what we are now saying is that anyone accused (but not proven to be corrupt) could or should be immediately taken and LYNCHED, then let’s note that no one among us (citizens) is safe. This is just to illustrate to us that society is at an end the very day you put a stop to supremacy of rule of law. Indeed, to call for suspension of the operation of rule law, the only safeguard for a sane society, is to call for enthronement of the worst form of corruption! Any action or decision of the people, or of leaders or of anyone else, which goes contrary to rule of law is an anathema, a threat to the very foundation of society and National security and an invitation to chaos. The greatest and safest way to civility and progress for any society/nation is to embrace rule of law as its inviolable creed, to which both the leaders and the led are subject. A society that ignores rule of law welcomes rule by arbitrariness, the subjective predilections of people in authority. Rule of law is the basis for any constitutional democracy. And without the rule of law in democracy, you have chaos. We cannot build foundations of a state without rule of law. The clearest way to show what the rule of law means to us in everyday life is to recall what has happens when there is no rule of law. Further, IS NIGERIA’S JUSTICE SECTOR SEPARATE FROM NIGERIA? It a big question we often mischievously ignore. 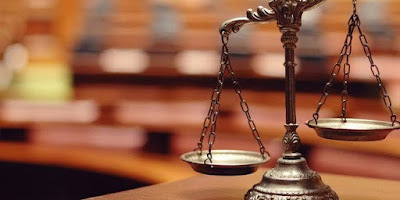 My humble take: I agree that Nigeria’s justice sector needs reform. Yes. But Nigeria itself and its system of governance are in much more more urgent need for radical reforms. When you reform Nigeria and its style and system of governance, you’d get/have the best justice delivery system in the world. *There’s no profession without bad eggs. * We see them in all professions. In the legal profession, we should continue to weed them out until we’re totally clean. Therefore, let misbehaving judges and Lawyers be PROMPTLY dealt with according to law. That’s the best reform. Let’s not label the entire Nigerian judiciary “corrupt” simply because of the conducts of some bad judges. Let’s not see all Nigerian lawyers as corrupt simply because some lawyers are found to misbehave. You don’t set an entire house on Fire because you want to catch one thief inside the house. That’s wrong procedure. If a lawyer or judge is found to be corrupt, let him face the law and let him be punished accordingly, to serve as a deterrent to others. The best reform is to quickly bring an alleged corrupt lawyer or judge to book, according to laid down legal procedures. We have enough laws and rules to guide us. Let’s respect our leaders . And let’s route proposed reforms in the legal profession through appropriate channels. Rule of law is paramount because justice, though due to the accuser and the society, is due the accused also.William Orville Douglas rightly stated, the function of the prosecutor under the Constitution is not to tack as many skins of victims as possible against the wall; his function is to vindicate the rights of the people as expressed in the laws and to give those accused of crime a fair trial. Oftentimes, we hear much of people’s calling out to punish the guilty; but very few are concerned to clear the innocent (Daniel Defoe). Lets tell ourselves the truth and stop all these shenanigans and grandstanding for selfish, partisan or sectional goals.